It’s funny. I didn’t even notice this cafe when I was here in Gulgong eating scones across the road at the Butcher Shop Cafe a week before. I guess with ‘patisserie’ written across the window, I just assumed it was a cake shop – that’s if I saw it. It’s after I go inside to scope out the place for scones, do I see the cafes bizarre name – Delumptious, which of course means both delicious and scrumptious (seriously, check the dictionary). Quite a cavernous space, it feels a bit like a burger and fish n chip shop with people lined up at the counter ready to order. But look closely and there are some yummy cakes and unusual ready-to-go meals available. If you want a good look at the kitchen and how your meal is being prepared, take a leisurely walk through to the rear of the building where courtyard seating has been set up. Otherwise sit out at one of the few tables on the footpath to watch the Gulgong action. There are both plain and date scones perched up on the counter, so I choose one of each. They are not made equal. The plain scone is lovely; light and creamy, whereas the date scone is super heavy, loaded up with too many dates. The jam is nothing extraordinary, and although the cream is freshly whipped, it is too light. Tea: A small variety of Lipton tea bags served in a cute cup/pot combo get up. 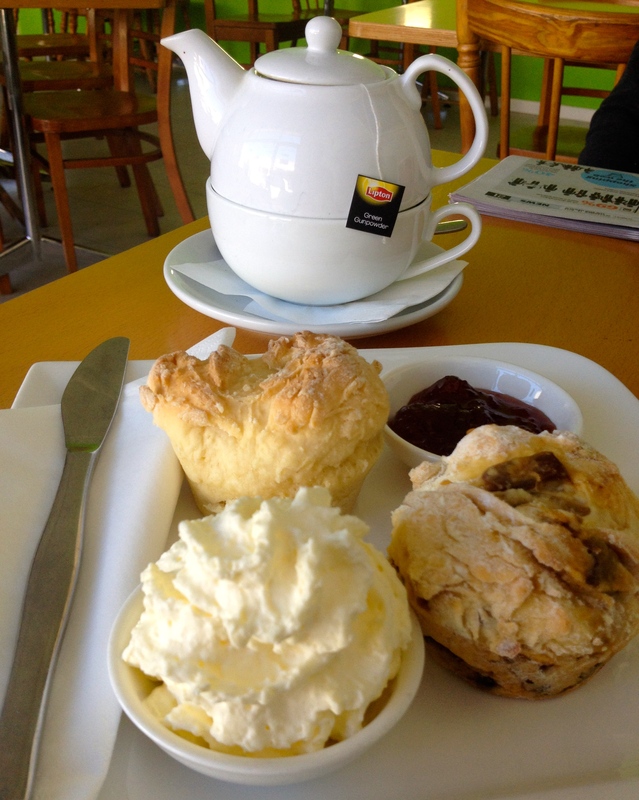 Overall: A no-nonsense cafe serving homemade scones.